Published by Bedfordshire Historical Record Society/The Boydell Press (Volume 92 in the series) in 2014. 292 pages ISBN 978-0-85155-079-4. Otainable from the publisher, Boydell & Brewer Ltd, PO Box 9, Woodbridge, Suffolk, IP12 3DF or e-mail trading www.boydellandbrewer.com Price � plus �postage. Methodism was a major social movement during the 18th and 19th centuries, transforming individual lives and popular culture, as well as influencing opinion and political participation. 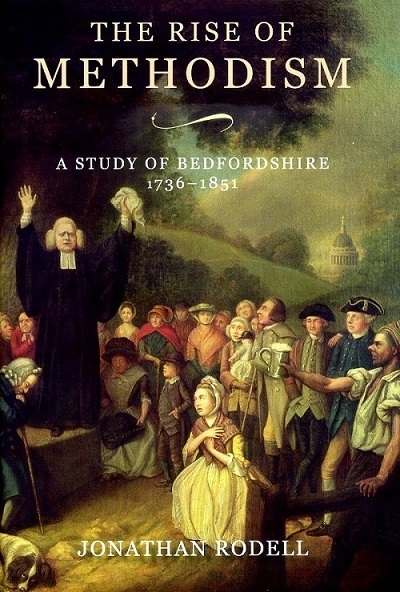 Rodell describes three phases in the growth of Methodism within Bedfordshire (from 1736 to 1790, 1791 to 1830 and 1831 to 1851). In his final chapter he sets this in context, including exploring what factors led Methodism to flourish in some areas (it became particularly strong in south Bedfordshire, but was less widespread in the north and east where it faced competition from Dissent, hostile landlords and smaller populations). He identifies the most important factor in the local geography of Methodist success as the level of female employment (in 1851 southern Bedfordshire had the highest rate of economically active adult females in England). The volume is based on exhaustive archival and published research, and is well-referenced and illustrated. Appendices include an evaluation of the sources for Methodist history and tables illustrating membership figures for Bedfordshire circuits. There is a helpful glossary, and the volume is thoroughly indexed, including local Methodist leaders and opinion-formers. Although well-researched and written, and published to a high standard as would be expected from the BHRS, this is probably not a book for the general reader. It should prove invaluable, however, to any serious student of the history and impact of religion and social movements in Bedfordshire, as well as to family historians whose ancestors were local Methodists.